Niagara Falls: When Is The Best Time To Visit? I’d imagine it really depends on what you’re looking for. 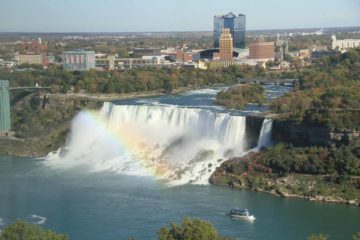 That said, I’m pretty sure that at the heart of most peoples’ desires upon a visit here would be a desire for a healthy moderate flow of the falls under agreeable weather with the availability of activities and services without overbearing crowds. Knowing that it’s highly unlikely to be having all of these desires on the same trip, timing a visit usually means trying to maximize the likelihood of having most of these desires while minimizing the bad stuff. So to that end, we can say that we have visited Niagara Falls on two separate trips so far. In those trips, we were able to correlate our experiences with what we had read about in the literature to draw some conclusions and seasonal trends that we’re conveying here in this article. 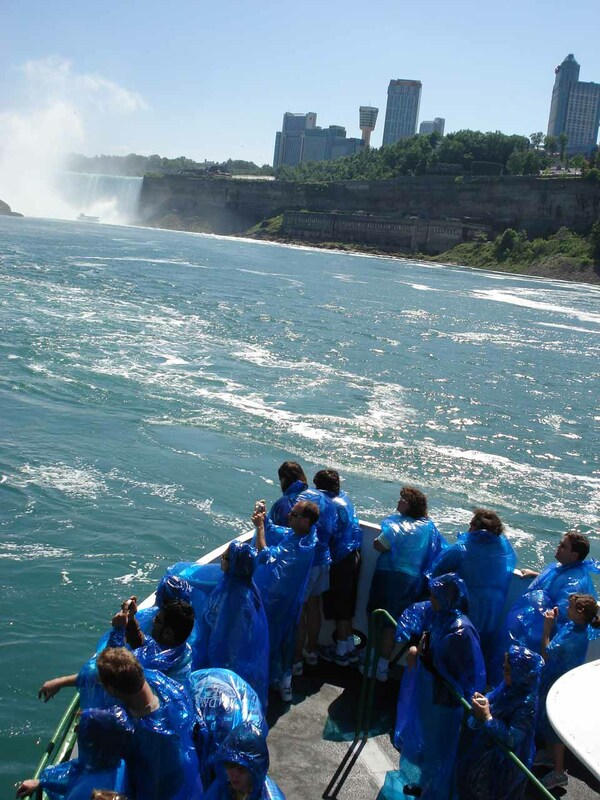 In addition to the climate, we’ll also cover other things concerning the timing of a visit like crowds. 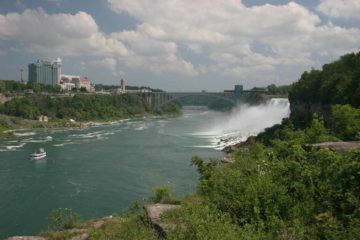 So far, we have made two separate visits to Niagara Falls. To give you an idea of the sample size of our personal experiences, here’s a quick break down. Our first visit was in early June 2007. 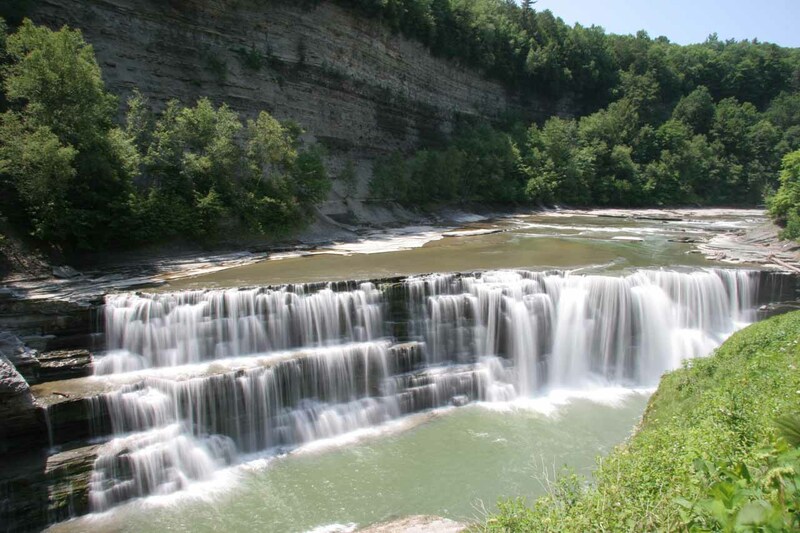 In that visit, we spent an extended amount of time not only in the Niagara Falls area but also in the gorges and lakes of the Finger Lakes region of Western New York. This trip covered a span of a little over a week. Then, six years later, we visited Niagara Falls again in early October. 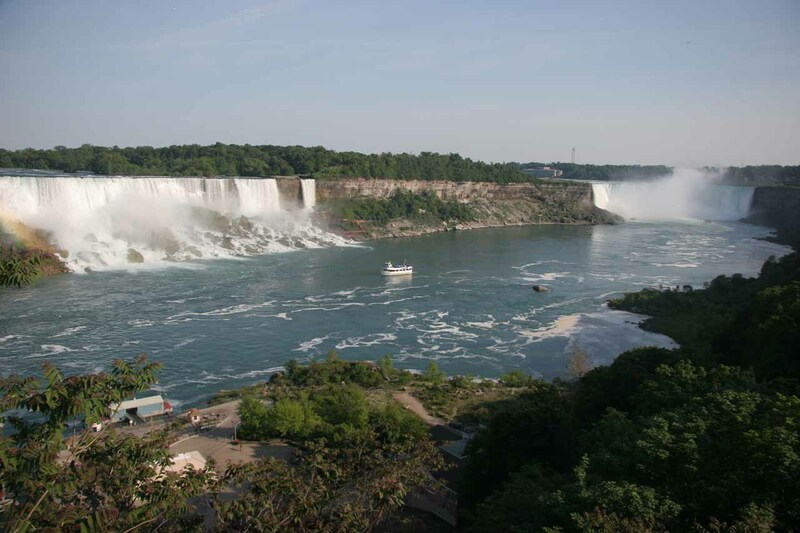 On that visit, we spent more time in the Niagara Escarpment area of the so-called Golden Horseshoe region of Ontario that included Hamilton and Toronto. We also spent a short amount of time in the Finger Lakes area while passing through to New York City to end that trip. The total number of days in this region on that part of the trip was on the order of a little less than a week. 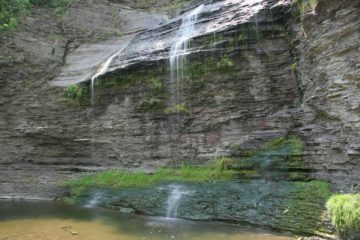 Our first visit took place at the very tail end of Spring and was for all intents and purposes the start of Summer. As far as the weather was concerned on that visit, we were met with blue skies, humidity, and the threat of pop-up afternoon thunderstorms from all that tropical humidity. 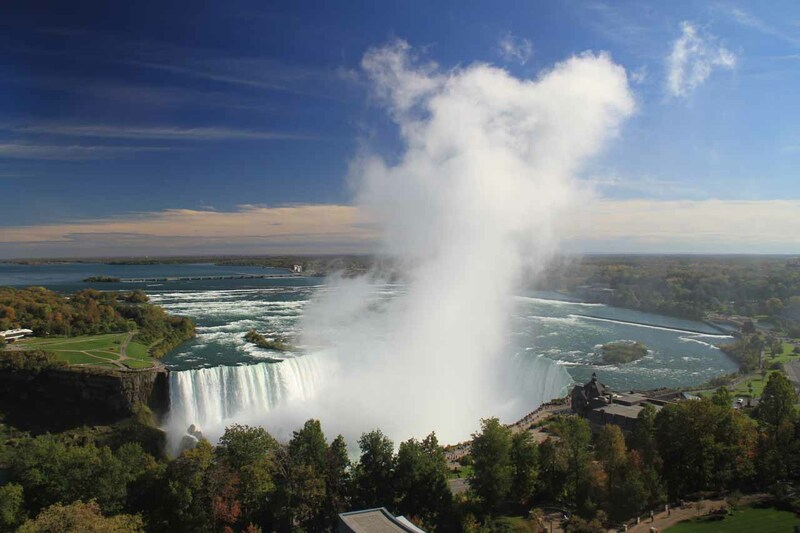 While the Niagara Falls itself possessed pretty good flow, we’d learn that it had surprisingly less water than our Autumn visit six years later. 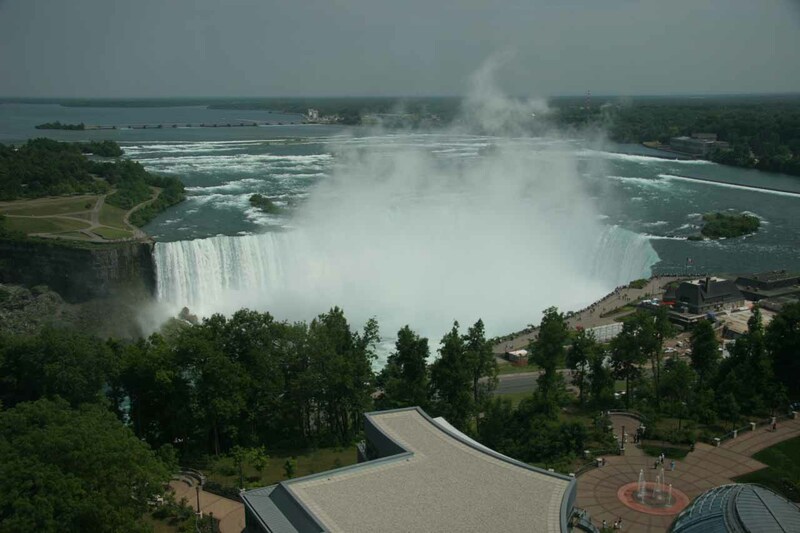 We were able to tell this by the amount of mist that rose out of the Horseshoe Falls section, which was noticeably less on our 2007 visit. 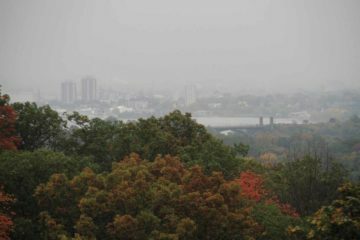 Whether the mist quantity was more of a function of the amount of moisture already in the air versus the waterflow of the Niagara River remains to be seen. But I’m running with the assumption that it had more to do with water volume than humidity. Of course as I say this, on a different watercourse like the Genesee River to the southeast of Niagara Falls, there was actually more water in that river in our early Summer visit than there was in our early Autumn visit six years later. Go figure. Anyways, the muggy conditions pretty much persisted throughout that week of our first visit to the region, which meant that any walking or hiking that we did would really make us uncomfortably sweaty. And while it didn’t rain where we were at, somewhere else in the region received a spotty thunderstorm cell or two. So the threat was always there, but generally the weather was sunny and getting warmer in the morning before there was enough convective energy to produce thundershowers in the afternoon. In summary, this visit was pretty much what I’d expect Summer conditions would be like except the heat and humidity could be next level intense as the height of the Summer season progresses. However, for all intents and purposes, the Spring season was well over as I’d imagine we probably missed it by about a month. Our second visit took place in early October, which was pretty much entering the sweet spot of the transitional season of Autumn. 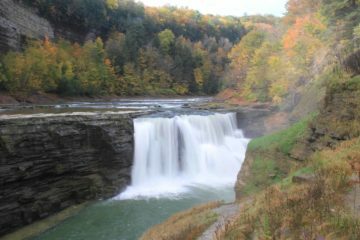 In my mind, Autumn was by far the best time to visit this area because of the Fall colors along with the cooler and crisper temperatures. Of course, there were drawbacks in terms of variable weather as we experienced a couple days of cold rain when we were in Hamilton and Toronto. Yet on the days we didn’t get rain, we were getting unseasonably warm temperatures with bright blue skies that were almost cloud free. 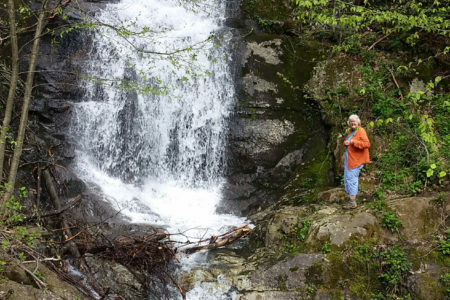 While there were trace amounts of humidity when we did short walks or hikes in sunny weather, it was nowhere near as sticky as it was on our first visit. That’s why we found this time of year to be quite delightful despite the mixed weather from the first weather systems moving through the region after the end of Summer. In fact, the temperatures seemed to be getting rapidly cooler with each passing storm (especially in the mornings) so the transition from Summer into Winter was well underway. 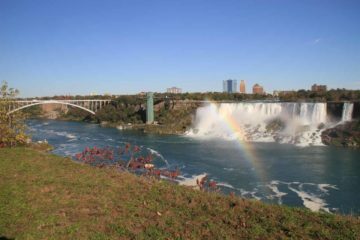 In terms of the seasons at Niagara Falls, we could point out climate patterns as well as crowd behavior. Here’s our breakdown. The Summer months of June, July, and August are characterized by high heat and humidity. As we attested to earlier when we talked about our personal experiences of our first visit, the maximum temperatures were in the high 80s and low 90s while the minimum temperatures tended to be in the 50s and 60s. However, it was uncomfortably muggy and sticky so it actually felt hotter than the thermometer would indicate. With such tropical moisture in the air, the weather was prone to thermal convection that would produce pop-up afternoon thunderstorms. It also tended to have sunny weather until the afternoon thunderstorms would build up and dominate the skies before breaking apart at the end of the day. I’ve read that the reason for this weather pattern is that in the Summer they tend to get tropical warmth from the Caribbean way to the south. As far as crowds were concerned, Summer was pretty much holiday season for just about every public school in the Northern Hemisphere, especially in the United States. Thus, holiday-making families with kids were commonplace. As a result, visitation was the highest this time of year, and it would probably further be exacerbated on weekends. Consequently, the prices were higher due to the surge in demand, but also activities and services were more available. This is a transition season that is prone to variable weather as well as temperature swings from warm to cold and back. We can attest to this variability as we managed to experience a couple days of cold rain with cool crisp mornings as well as warm sunny days interspersed in between. Personally, I found this season to be the most enjoyable because as the cold temperatures start to predominate, the leaves started to change color. 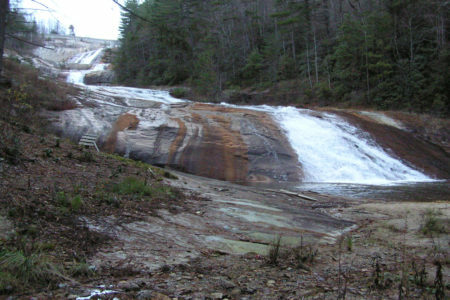 The result was the onset of the beautiful Fall colors that much of the Eastern half of the United States was known for. The reduced humidity also helped in the sharpness of our photos as the scenes we captured were less hazier than they would have been in the muggier Summer. 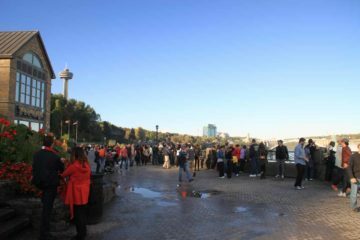 When it came to crowds, I was under the impression that Niagara Falls was always crowded because it was certainly busy during our Autumn visit. However, we didn’t realize that the 2nd week of October happened to be near the Canadian Thanksgiving, which was a public holiday there. That was separate from the American Thanksgiving, which occurred in late November. So perhaps that was why it was so busy, and in other times of this season, the falls would not be as crowded. It also appeared that activities and services were still as available as they were in the Summer time, but I’d imagine as the season continues towards the colder months, the services and amenities slow down a bit. We haven’t visited Niagara Falls during the Winter time, but we can imagine how it could be frigidly cold as this part of the Great Lakes region would be prone to Arctic Winters. Historically, temperatures are said to range from highs of 60 degrees F (16 degrees C) to lows of -10 degrees F (-23 degrees C). Anecdotally, I’ve seen NFL football games where the Buffalo Bills would be playing in snow (Buffalo being around 30 minutes drive south of Niagara Falls), and that kind of indicated what the falls might be like that time of year. 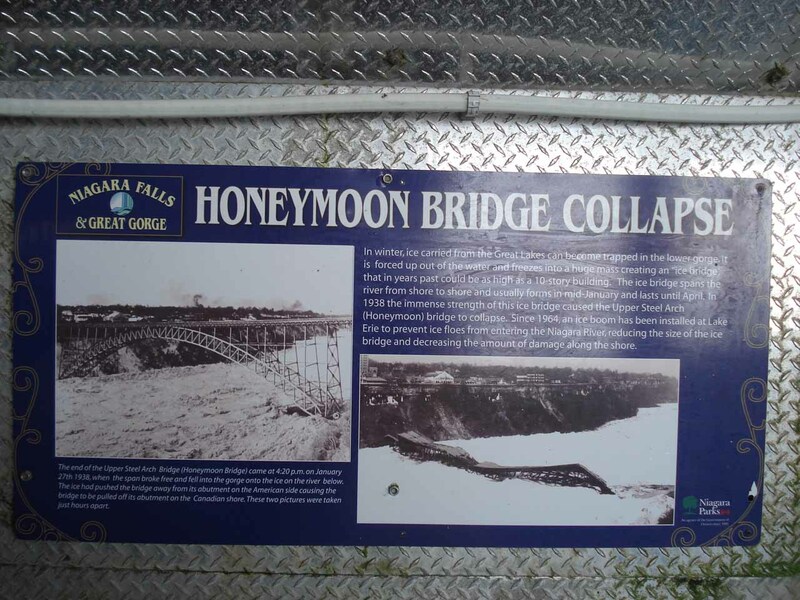 On one of the sign boards we saw at Niagara Falls, the Niagara River could be frozen enough to form ice bridges that would obliterate bridges (including the Honeymoon Bridge) or any other riverfront infrastructure in the way (much like how glaciers could scrape through anything in its path). However, an ice boom had since been created further upstream to limit the size of the ice chunks and thus allow the river to flow freely towards the Atlantic. That gave us a further appreciation of how cold it could get in these parts. The weather would also be even more variable at this time of year, but historically, sunny (but very cold) days could also occur. 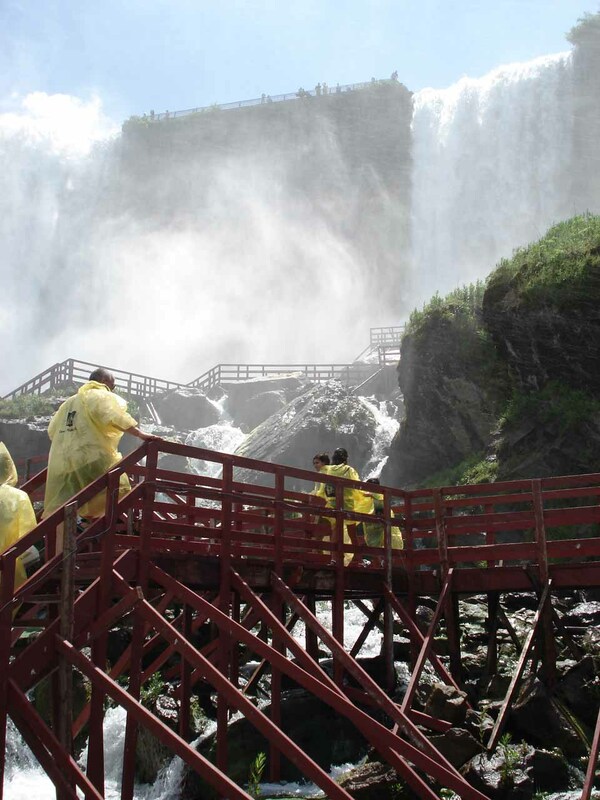 Naturally, this was the slow season at Niagara Falls. So if we were looking to avoid crowds and the subsequent drop in prices, this season would be it. 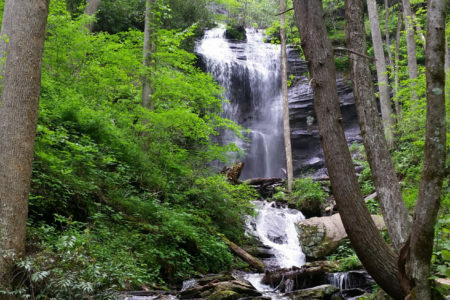 In this transitional season from Winter to Summer, the shoulder season months of mid-March through May tended to bring variable weather as the snow and ice would thaw. It has been said that it can still be frigidly cold come March and April, but come May, the first convective afternoon thunderstorms could start forming. 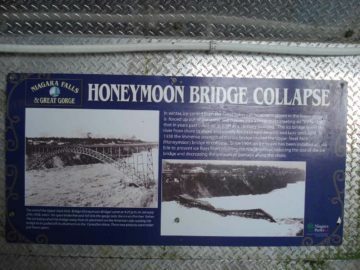 We certainly experienced this on our first visit to Niagara Falls at the very end of May. Like with the Autumn season, the number of rainy days mixed with sunny days was unpredictable but not non-existent at either end of the spectrum. With the exception of Easter and Spring Break, the crowds could still be at a tolerable level, which would make the season pleasurable for a relaxing or romantic ambience. We can’t vouch for the beginning of the season since we haven’t experienced it ourselves, but I’ve been told by locals that the waterflow would be highest for many of the smaller seasonal waterfalls of the Niagara Escarpment though that’s not necessarily true of Niagara Falls itself (as we had noticed on our trips). So in the end, if I had to pick an optimal season to visit, personally I like the Autumn the best. Of course, that’s just my opinion. I can easily foresee people looking for activities to prefer the Summer, while those looking for more greenery would prefer Spring. Heck, I could even see those looking for a quiet experience to prefer Winter. 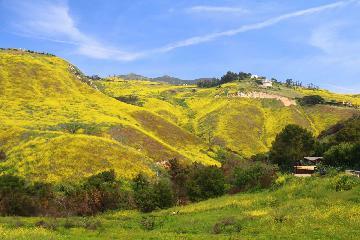 Like I’ve said before, it’s really up to you and what you’re looking for to determine when you should make your visit. But one thing’s for sure, this is a year-round destination, and you’re bound to have an unforgettable experience regardless of which time you choose. 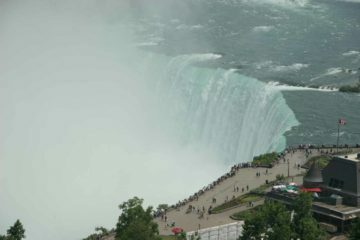 Just to give you an idea of how our experiences went at Niagara Falls, here are some more pictures taken from our visits.